The estate vineyard is close to the city of Melbourne, and is planted predominantly to Shiraz and Cabernet Sauvignon, with smaller parcels of the more esoteric varietals. With it's rich, red volcanic soil, attention to detail in vine management and low yield targets, the estate is focused on producing premium quality wines. As the vines grew toward maturity over the years, the estate was able to select an increasing amount of good fruit, and to produce approximately 12,000 cases annually. The Rockbank site features rich red volcanic soil over clay loam, interspersed with rocky outcrops. The vineyard is on a north-south axis and the vine trellising uses vertical shoot positioning to increase exposure to sunlight. Planting commenced in 1997 and the vineyard contains smaller blocks of Chardonnay, Pinot Noir, Sauvignon Blanc, Semillon and Merlot. Very special to the winemaking team are the exciting Italian varietals of Pinot Grigio and Sangiovese. Although only relatively new, Galli Estate wines have already been recognised for quality in Australian wine shows, receiving Gold and Bronze medals for Cabernet Sauvignon, Gold for Pinot Grigio, three Bronze for Shiraz, as well as Bronze for Chardonnay and Sangiovese. Additionally the wines have received favourable reviews from noted Australian wine writers such as James Halliday. Facilities constructed at Rockbank include the winery, a sales and administration centre and an underground cellar. 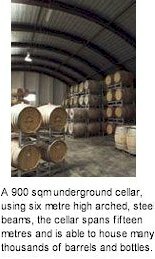 Fifteen metres wide, six metres high and over 900 square metres in area, the earth covered cellar provides natural temperature and humidity control and houses the many hundreds of French oak barrels used for maturing the wines. The impressive cellar, winery and Cellar Door/ Administration buildings were built on the principles of the ancient arch system, employing steel arches surplus to the construction of the Burnley tunnel in Melbourne's city link project, giving a unique look and feel to the site. In addition to the development at Rockbank, the Galli family have established a 250 acre vineyard at Heathcote, a Victoria wine region with an enviable reputation for quality, particularly in red wines. Located in Central Victoria about 100 kms north of Melbourne, the Heathcote wine region is classified as warm, and rainfall is limited. The growing season is warm and dry with relatively even temperature ranges during the ripening season. The harvest occurs from mid-March. To date the Heathcote region is best known for outstanding Shiraz, and Galli Estate is well placed to develop this reputation. Accordingly, this vineyard features Shiraz, but is also planted to another exciting Rhone variety, the white grape Viognier. Pinot Grigio has also demonstrated an affinity with the site, in 2002 producing a wine which won medals at recent Australian wine shows. The balance is planted to Cabernet Sauvignon and other grapes which, in keeping with the innovative nature of Lorenzo Galli, are less familiar but show exciting potential - Sangiovese, Nebbiolo and Tempranillo.